The Current Health Scenario. : What if the "Germ Theory" was wrong? Most people are familiar with the Germ Theory of Medicine. It has formed the foundation for our modern scientific medicine since it was popularized by Louis Pasteur (1822-1895) who was a chemist. It is the reason you hear people proclaiming that there is a ‘bug going around’ and they ‘caught a bug’. Often these same people will warn you to keep your distance so that you don’t ‘catch it’ too. This Germ Theory (also known as monomorphism, meaning one form), claims that fixed species of microbes from an external source invade the body and are the first cause of infectious disease. This belief that ‘bugs’ will infect us and make us sick is so deeply ingrained that nobody ever questions it. But what if this belief we have accepted for over 150 years is simply not true? At one time the belief that the earth is flat was accepted without question. To question it was ‘heresy’. Do people still believe the earth is flat? If not, what happened to that ‘truth’? A scientific theory is an explanation of some aspect of the natural world that has been substantiated through repeated experiments or testing. Research bias, also called experimenter bias, is a process where the scientists performing the research subconsciously influence the results, in order to portray a certain outcome. Faith is defined as “strong or unshakable belief in something, especially without proof or evidence”, usually used in reference to religion or dogma. Once a scientific theory is accepted as ‘truth’, no further investigation is allowed, particularly if it might reveal new information that could contradict the accepted ‘wisdom’. In a sense, it becomes a form of scientific dogma. We believe it is true, therefore it is true. But isn’t science supposed to be based on facts rather than beliefs? Isn’t science supposed to explore all the evidence in order to expand our understanding of the world?...even if it means a paradigm shift? There is, in fact, a growing body of evidence indicating that our long-held belief in The Germ Theory of disease, is incorrect! Rudolf Virchow (1821-1902), father of the germ theory, stated in his later years, "If I could live my life over again, I would devote it to proving that germs seek their natural habitat - diseased tissues - rather than causing disease." Antoine Béchamp (1816-1908), M.D., one of the world's foremost bacteriologists was a contemporary of Pasteur and Virchow. He made many great scientific discoveries and some of the greatest minds of his day accepted his theories and findings as definitely established facts. Béchamp attained so many achievements that it took eight pages of a scientific journal to list them when he died. Béchamp is quoted as saying, "There is no doctrine so false that it does not contain some particle of truth. It is thus with microbian doctrines." What makes the germ theory so dangerous is that it seems so obviously true. But it is true only secondarily. Béchamp discovered Microzyma (now known as micro-organisms), minute or small ferment bodies - the basic structure of cell life; and that germs definitely are the result, not the cause of disease! Through his experiments he showed that the vital characteristics of cells and germs are determined by the soil in which their microzyma feed, grow and multiply in the human body. Both the normal cell and germ have constructive work to do. The cells organize tissues and organs in the human body. Germs cleanse the human system and free it from accumulations of pathogenic and mucoid matter. Other scientists tested Bernard’s theory. Elie Metchnikoff, a Russian immunologist a generation younger than Bernard and Pasteur, suggested that a synergistic interaction exists between bacteria and its host. He, too, claimed that germs were not the problem. To prove it, he consumed cultures containing millions of cholera bacteria; he lived to write about it, and didn’t even get sick. Microbes are everywhere. They are on us, in us, on everything we touch, in the air we breathe...there is nothing that isn’t covered in and full of microbes. Bacteria are the oldest living organisms. If germs are so harmful, why aren't we all dead? According to current scientific findings, we are surviving because of, not in spite of all the microbes! In fact, over the past 10 years or so, the Human Microbiome Project has discovered that90% of the cells in our human bodies are microbes (bacteria, virus, parasite, fungus). Our bodies are densely populated with microorganisms, inside and out. What inhabits us doesn't hurt us and is essential to our health and survival. We live in a symbiotic, mutually beneficial, mutually necessary relationship with our personal population of bacteria and other microbes just as Metchnikoff suggested in the mid 1800s! Even Pasteur himself abandoned his earlier belief in the Germ Theory and became convinced that the disease came first, the germ second. He stated, "The presence in the body of a pathogenic agent is not necessarily synonymous with infectious disease." It is the scientific medical establishment’s unquestioning belief in the Germ Theory that has led to the development of drugs as the greatest ‘weapon’ in our ‘war’ against germs. The development of antibiotics and vaccines have been hailed as some of the greatest contributions to humanity. As mentioned, bacteria are the oldest organisms on the planet. They have survived and adapted to any and all circumstances and it is their brilliant ability to change and adapt that has been the key to their survival. It really should not surprise us that by trying to kill them with our antibiotics, we have prompted them to adapt in the form we call ‘super-bugs’, antibiotic-resistant strains of bacteria. When talking about vaccines, we are told that they are proved to be effective because the body forms antibodies [the Ehrilich theory]. However, some individuals are incapable of producing antibodies, yet after getting the natural (wild) version of a disease, they develop lifetime immunity to that disease. Others who are vaccinated, and are found to have formed plenty of antibodies will, in fact, develop the disease for which they have been vaccinated. Dr. W. H. Manwaring, Professor of Bacteriology and Experimental Pathology at Leland Stanford University (early 1900s) proclaimed: "Not only is there no evidence of these so-called antibodies being formed. But there is ground for believing that the injected germ proteins hybridize with the body proteins to form new tribes, whose characteristics and effects cannot be predicted. Even non-toxic bacterial substances sometimes hybridize with serum albumins to form specific poisons which continue to multiply, breed and cross-breed, ad infinitum, doing untold harm as its reproductivity may continue while life lasts." He continued, "In spite of millions of dollars spent on research and tens of millions spent in commercial exploitation, of 100 theoretically logical monovalent, polyvalent, prophylactic and curative anti-sera , 95% of them were thrown into the clinical discard. The same thing is true of vaccines...and we call this scientific medicine. Twelve years of study with immuno-physiological tests have yielded a mass of experimental evidence contrary to, and irreconcilable with, the Ehrilich theory, and have convinced me that his conception of the origin, nature and physiological role of the specific "anti-bodies" is erroneous." What if the Germ Theory is incorrect? Since 90% of our cells are microbes, as current research has discovered, then our ‘war’ on ‘bugs’ has been and continues to be a war on our own bodies! In spite of the fact that the information from the Human Microbiome Project has been available to the medical profession for over 10 years, doctors continue to prescribe antibiotics, often ‘just in case it might be a bacterial infection’. Antibiotic means ‘against life’ and by destroying our helpful microbial populations we are destroying ourselves. It takes your gut microbiome a very long time (a year or more) to recover from even one round of antibiotics. Why would the medical establishment cling to the Germ Theory? As I discussed in the January newsletter, a little over a hundred years ago, Rockefeller medicine was born and the current medical system became established….a system that was established to promote the use of chemicals produced by the arm of the ‘chemical industry’, now known as the ‘pharmaceutical industry’. It is an industry which, like other businesses, is primarily focused on making money. If this extremely lucrative industry was to accept that the Germ Theory is not true they could not continue with ‘business as usual’, selling trillions of dollars worth of antibiotics, vaccines and other pharmaceuticals. The agricultural industry would likewise have to stop its use of pesticides, herbicides, GMOs, etc. All of these chemicals are toxic to our human microbial cells and those in plants, soil, etc. The new paradigm would mean a recognition of the supreme importance of nourishing our ‘inner terrain’...taking in only nutritious food grown in healthy (microbe-rich) soil, clean air, clean water, etc. If we take care of our microbes, they will take care of us! What do your microbes do for you? 1. Digestion: They provide enzymes that allow us to get 10-30% more energy (calories) from our diet, improve our absorption of vital dietary nutrients, tune the acidity of our stomachs to the optimum and can also determine our tendency towards obesity. 2. Vitamin production:Microbes provide essential vitamins that we do not have the capacity to make ourselves. 3. Immune function:Microbes train the immune system to stay healthy and alert to potential threats while not over-reacting in the absence of threat. Our friendly microbes are also part of our immune system. They help fight off pathogenic microbial strains and so protect us from infection. 4. Brain function: Research has indicated that the nature of the gut microbiome influences communication in the brain and mood. 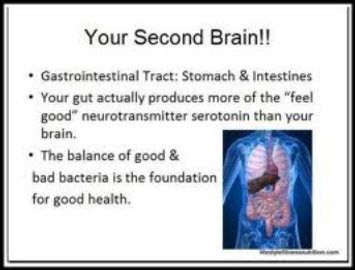 95% of serotonin and 50% of dopamine is produced in the gut (not the brain)! 5. Kidney function: Microbes can impact our tendency to form kidney stones. 6. Healthy skin function: Microbes on the skin work with the immune system to maintain healthy skin and keep out pathogenic microbe strains. It seems to me that in the new paradigm we need to redefine the immune system. Rather than the ‘war’ model, where we see it as a defending army, as with our outer world, we need to focus on creating a peaceful, cooperative environment. That is what holistic healthcare is all about....encouraging greater communication, balance and harmony. The microbiome plays a huge role in our internal balance and overall health! Our view of the microbiomes is evolving rapidly. Most of the information on the human microbiome has come out since 2006, especially in the past couple of years. The view is very dynamic as more exciting data is coming out all the time. We now know that everyone's microbiome is unique. Your microbiome talks to your cells in their local neighbourhoods: immune cells, epithelial cells, endocrine cells, and nerves. This communication gets passed along to the brain where it can affect your emotions and brain function. The microbes also talk to each other! They sense their neighbours in the community and work to stay in a healthy balanced ecosystem (as best they can). A healthy microbiome creates a healthy immune system. A key benefit of our tiny “friends with benefits” is in education of our immune systems in tolerance. This builds up the peacekeeping arm of the immune system and helps lower over-reactions that lead to inflammation, allergies, intolerances and autoimmune imbalances. Our gut microbiome is essential for healthy digestion and can determine whether you are fat or lean. Our microbes generate energy (calories) and nutrients for us from our food, digesting things we cannot, making vitamins we cannot. They respond rapidly to what we put in our mouths – bugs bloom into abundance and die off quickly, depending on whether their food of choice is available. The more diverse your diet, the more biodiversity there will be in the microbiome. The more biodiversity in the microbiome, the healthier you are. Feed your bugs! The beneficial microbes prefer a breakfast of plant fibre lunch of plant fibre, dinner of plant fibre and then a dessert of plant fibre. Prebiotics are present in about 30,000 edible plants. Some foods rich in naturally occurring prebiotics include garlic, leeks, onion, asparagus, artichokes, wheat bran, banana, barley, and rye. Our overuse of antibiotics and other drugs, our diet and chronic stress all affect our microbiome which, in turn, affects all the systems and functions of the body (especially brain and immune system). 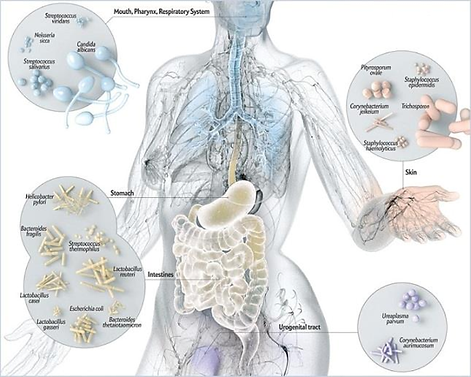 It seems increasingly clear that the compromising/disruption/destruction of our microbiome is a major (perhaps the main) factor in virtually all of our chronic ‘modern diseases’.....digestive disorders, immune disorders, autoimmune disease, allergies, etc. The good news is that with holistic mind-body medicine we can help to balance the microbiome as part of your whole bodymind complex. Truly holistic healthcare is health care designed by your body.